Selling games should be easy: you offer them to someone, someone gives you money and that’s that. But it’s not that simple, unfortunately. Prices seem to fluctuate more than a bad day on the stock market, and trade-in deals can be more confusing than a 10,000 page legal document written by a chimpanzee. And that’s not even taking into account choosing which games you’re going to sell! We’ve had enough. We don’t want to spend ages trying to sell our stuff, we want to spend our time shooting people in the face on Call of Duty and playing funny mods on Skyrim. 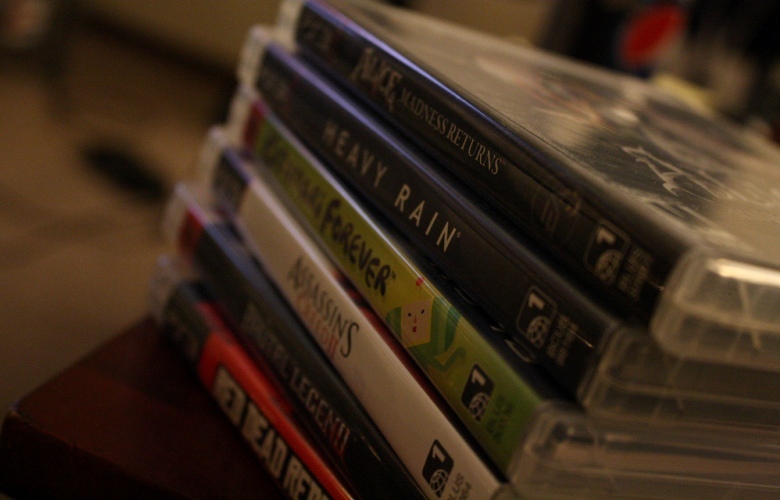 So, we decided to put together this surprisingly easy guide to selling your games with the minimum of fuss. Gamers are typically completionists; you only have to see the lengths people go to in order to earn pointless achievements for evidence of that. This dedication to completing everything extends to playing through rubbish games too. Why are we so committed to completing a game we know is terrible when most of us would put off a rubbish movie halfway through? It’s not worth the time or effort. Sell them, make some cash and earn back some valuable gaming time too! Some games are so hard that they can bring grown men to tears, Dark Souls II being an obvious example. While the dedicated among us keep going through sheer determination and a willingness to learn, the time-strapped or plain hopeless will remain forever stuck on the flipping Smelter Demon. Here’s a little secret for you: it’s perfectly fine to sell games you’re rubbish at! Just don’t tell your friends, or they WILL judge you. See this kid? He really, really needs to sell his copy of FIFA 14 for his own safety. If a game annoys you this much, get rid of it for the sake of innocent TVs and controllers everywhere. Please. How many games have you got sat on your shelf, waiting hopefully for you to play them again? Be honest: you’re not going to play them again, are you? Do the right thing and sell them. Trade-ins have become second nature to gamers, with some not even realising there’s an alternative. But trading your games for other games isn’t always your best option. For one, you have to shop in the same place as you traded. That’s alright if they’ve got a sale on, but not so good if you’re dealing with the retail equivalent of Scrooge McDuck. Selling your games for cash gives you the freedom to shop around, and the savings you’ll make can match the difference between the cash and trade-in price. It’s no secret that games lose their value over time, so every second you spend hunting down little trinkets to earn a pointless achievement is money lost. As soon as you’re fully done with a game (and you’ll know in your heart when…), sell it. Even the games you don’t think are worth much could earn you a pretty penny. It’s always worth getting an instant price just to see! Going to the shops and trading your games is a massive pain that drains away your precious gaming time. Do it all online and keep on gaming! Have you got any surprisingly easy tips for selling games that you’d like to share? Tell us in the comments! Oh, and don’t forget that you can WIN an Xbox One if you sell certain games this August. Check out this blog post for more information. ← [THIS COMPETITION IS NOW CLOSED] Trade any of these games and you could win an Xbox One!